By means of questionnaires and polls, newspapers and magazines asked their readers to identify the essentials of the ideal postwar house. Architectural competitions called for designs suited to immediate postwar building. The plans published in response were often described as ‘basic’ or ‘minimum’ but were designed to allow for future extension. 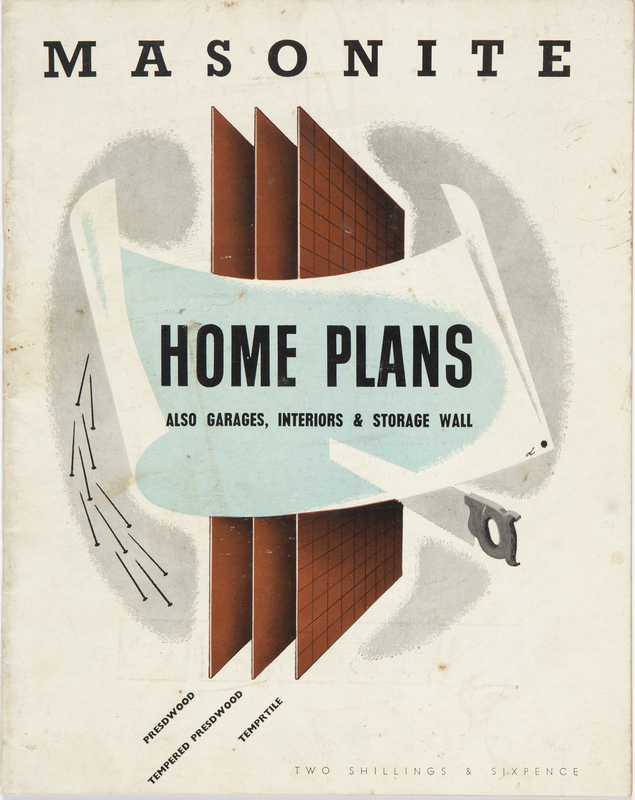 In the 1950s the scale of architectural advice available to home builders grew enormously, as architects, department stores, home magazines and the Sunday newspapers formed a series of partnerships to provide home-plan services. These services commonly offered a complete set of house plans and specifications, prepared by an architect, at a fraction of the normal cost. Some partnerships were short-lived – the Sunday Telegraph’s plan service, offered with architect John P Ley in November 1953, lasted only a few months – but the Small Homes Service initiated by the NSW chapter of the Royal Australian Institute of Architects, and the plan bureaus established by Grace Brothers and The Australian Women’s Weekly, endured into the 1960s. Cover detail of: Eve Gye, ed., The Australian Women's Weekly presents home plan, 1946. Caroline Simpson Library & Research Collection. See library catalogue record for more information. 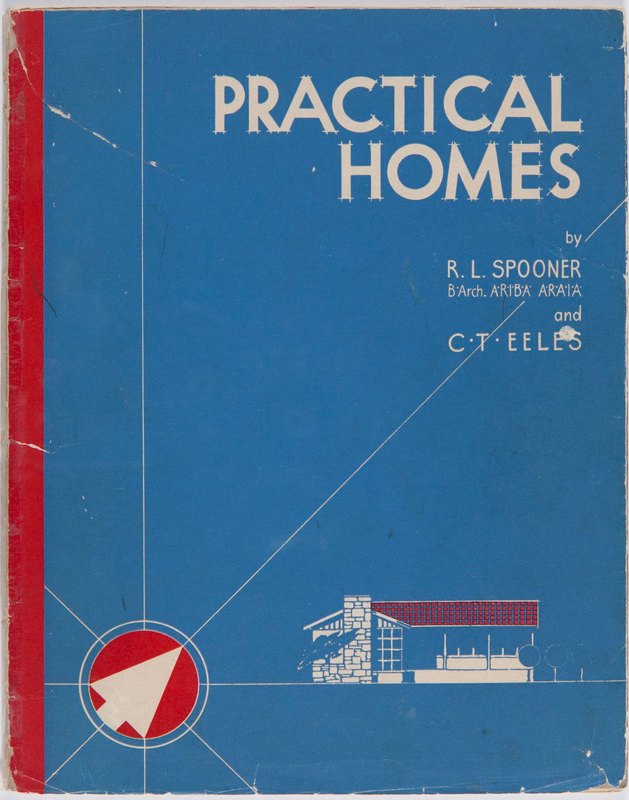 The 45 home plans published in this book included plans from Australian architects ‘noted for their freshness and originality’, as well as designs from ‘foremost American architects’. The Australian architects were S E Ancher, Albert Hanson, Samuel Lipson and Edwin R Orchard from NSW, and Trevor Bain, Robert C Coxhead, Edgar Gurney, John P Mockridge and L E Rowell from Victoria. 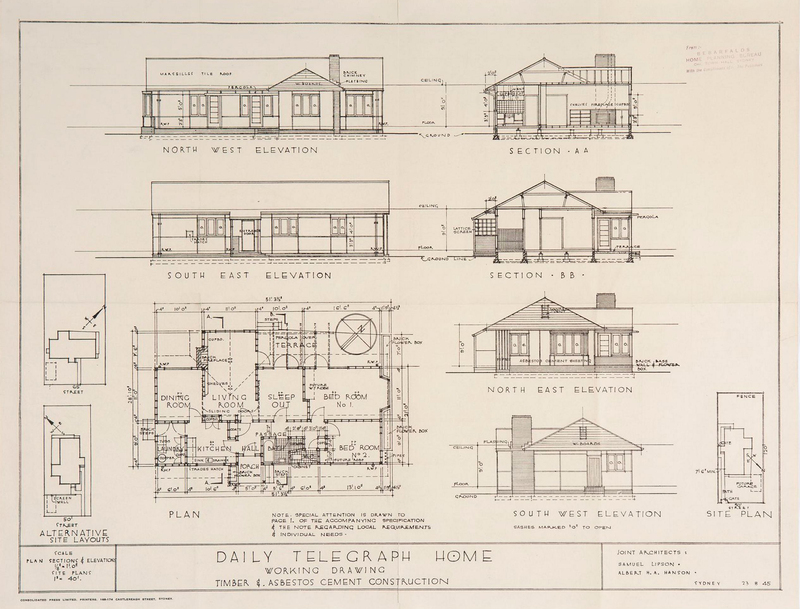 A folded plan of the: Daily Telegraph house, Sydney, 1945. Caroline Simpson Library & Research Collection. [RB 728.6 DAI]. See library catalogue record for more information. The folded plan includes elevations and floor plan, is titled 'Daily Telegraph home, working drawing, timber & asbestos cement construction', signed by Samuel Lipson and Albert H.A. Hanson as joint architects, and dated 23.8.1945. 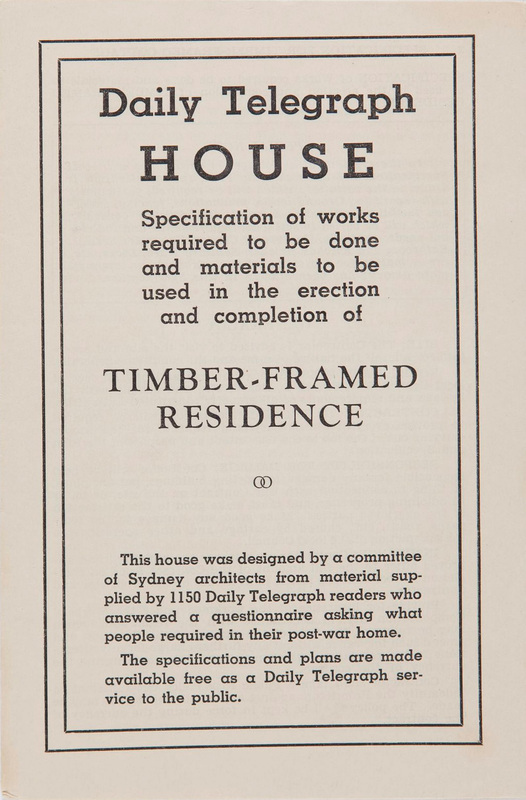 Daily Telegraph house: specification of works required to be done and materials to be used in the erection and completion of timber-framed residence, Sydney, 1945. Caroline Simpson Library & Research Collection. [RB 728.6 DAI]. See library catalogue record for more information. R.L. Spooner & C.T. Eeles, Practical Homes, Angus and Robertson, Sydney, 1947. Caroline Simpson Library & Research Collection. 728.370994 SPO. See library catalogue record for more information. This was a publication intended for home builders of ‘moderate means’. The plans were given labels such as ‘Simple charm’, ‘Controlled sunlight’, ‘Economical simplicity’, ‘Flat roof’, ‘Future extension’, ‘Home with a garage’, ‘Cross ventilation’, ‘Work saver’ and ‘Utility dwelling’. 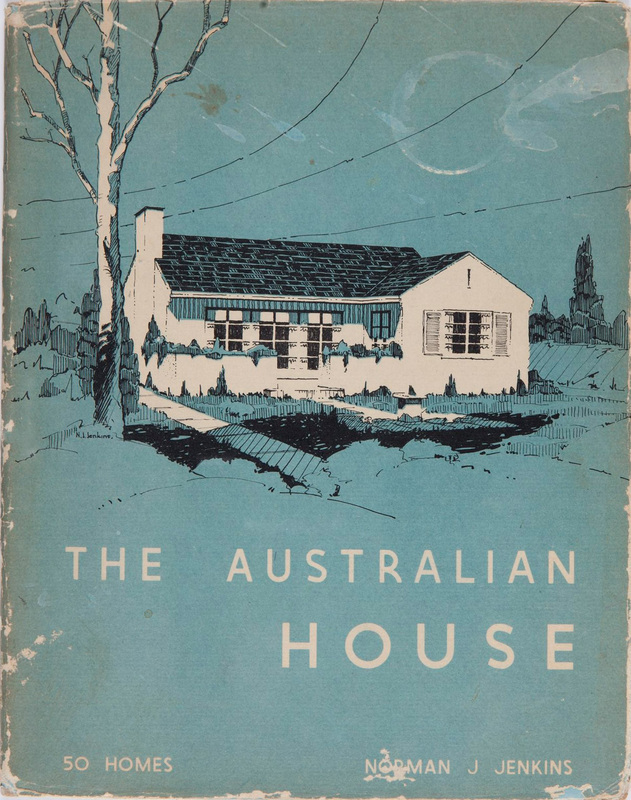 Norman J Jenkins, The Australian house, W J Nesbit, Sydney, 1946. Caroline Simpson Library & Research Collection. [728.370994 JEN]. See library catalogue record for more information. Design by architect Albert Hanson in Eve Gye (ed), Home plans, Australian Women’s Weekly, Sydney, 1946. See library catalogue record for more information. 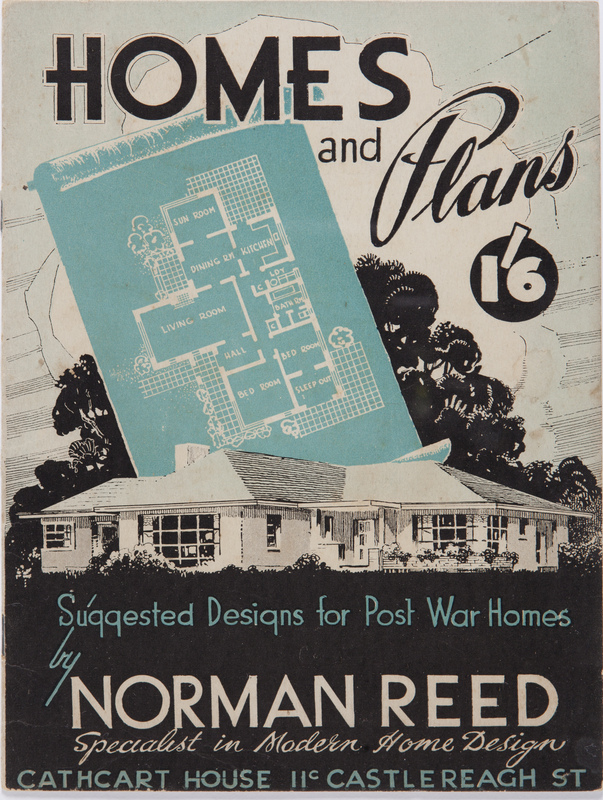 Norman Reed, Homes and plans: suggested designs for post war homes, Norman Reed, Sydney, c1945. See library catalogue record for more information. 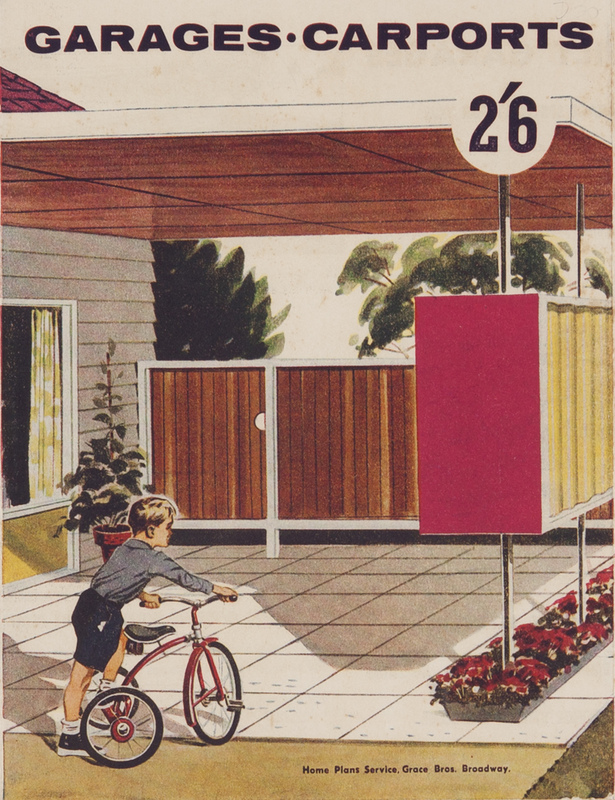 Masonite home plans: also garages, interiors and storage wall, Masonite Corporation (Australia) Limited, Sydney, 1947. See library catalogue record for more information. 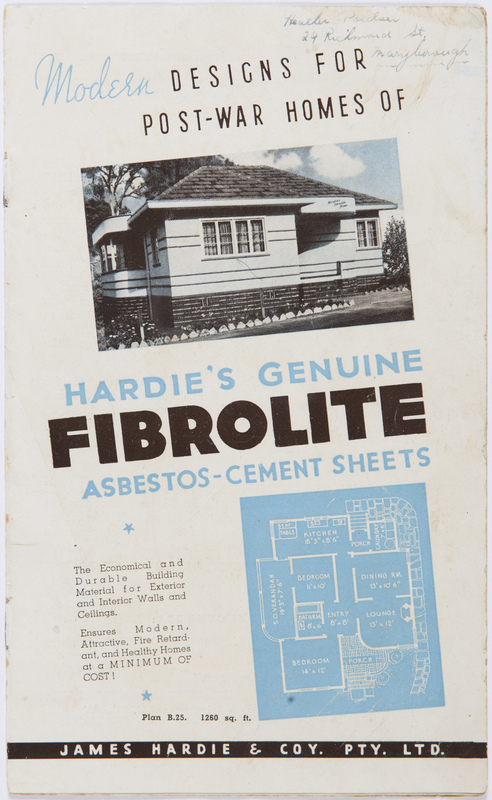 Modern designs for post-war homes of Hardie’s genuine fibrolite asbestos-cement sheets, James Hardie & Co, Sydney, c1946. See library catalogue record for more information. 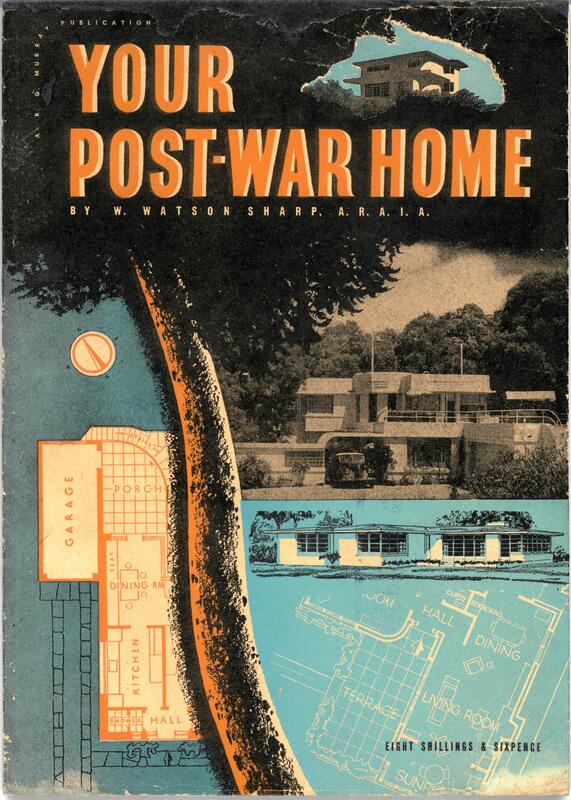 Your post-war home, by W. Watson Sharp, K.G. Murray Publishing, Sydney, 1945. See library catalogue record for more information. William Watson Sharp (1905–1984) was a Sydney architect and architecture writer. From 1938 to 1944 he edited the modernist journal Decoration and Glass, and in the post-war period was the architecture editor of Australian House and Garden magazine. 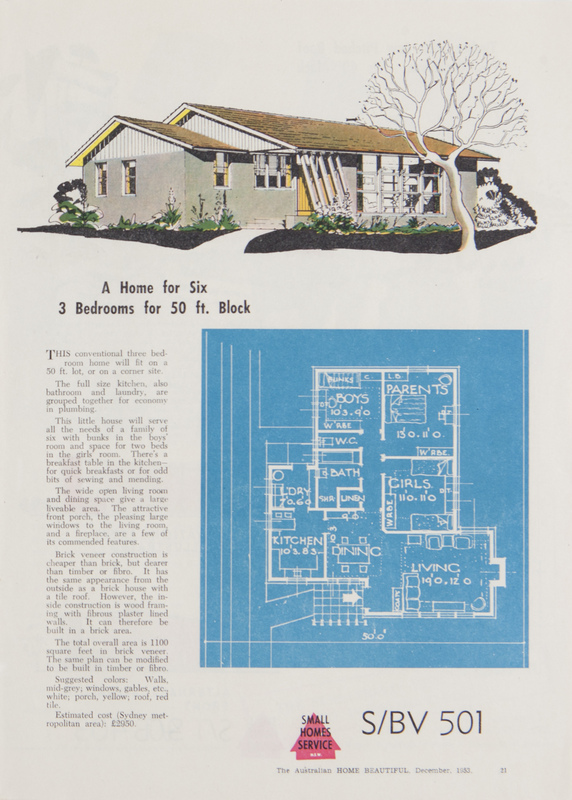 In 1945 he published a guide to Planning home and garden, and Your post-war home, a book of 19 home plans. This was followed in 1946 by Cavalcade houses, a compilation of plans published in the magazine Cavalcade from 1944 to 1946. Watson Sharp’s designs were presented as unpretentious modern homes intended to suit Australian conditions. In November 1953 Sydney’s Sunday Truth newspaper launched a new home-plans service for readers, in association with the department store Anthony Hordern & Sons Ltd. It was a service, according to Truth, ‘whereby the man in the street, striving to build his own home, may have the expert help of a leading Australian architect at absolute minimum cost’. Truth’s architect was Harry Divola, a prominent designer of modernist houses in Sydney and director of the home-planning bureau of the Australian Legion of Ex-Servicemen and Women. 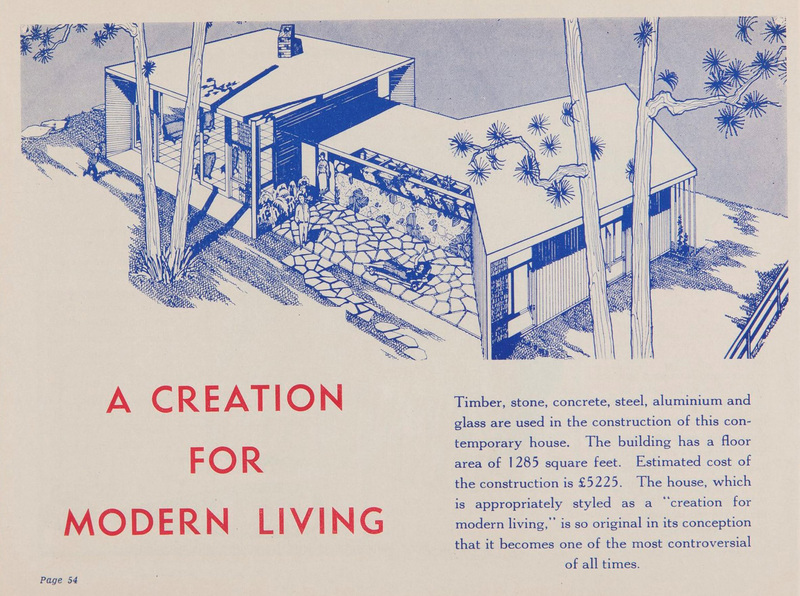 ‘A creation for modern living’, from H L Divola, Truth’s home plans book: selected designs from Anthony Hordern’s Home Plans Bureau, Invincible Press, Sydney, 1954. See library catalogue record for more information. 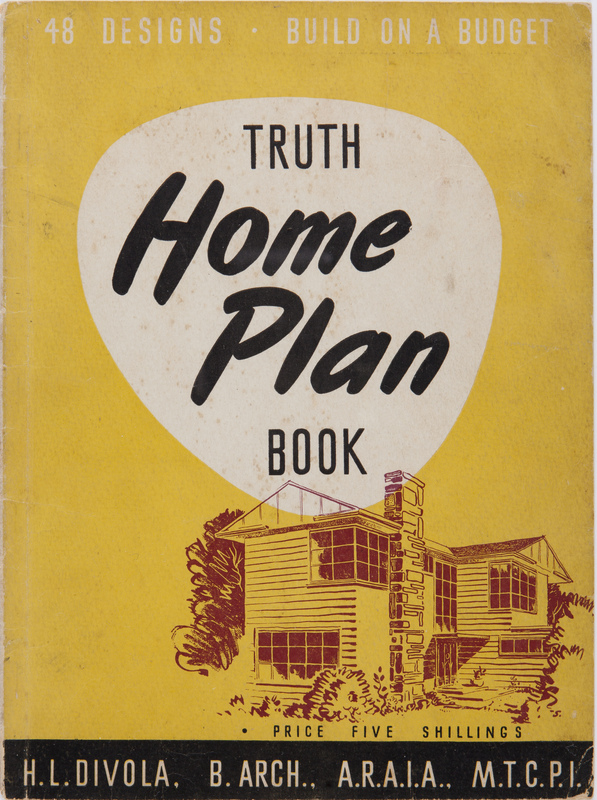 H L Divola, Truth home plan book, Invincible Press, Sydney, 1951. Caroline Simpson Library & Research Collection, Sydney Living Museums. See library catalogue record for more information. 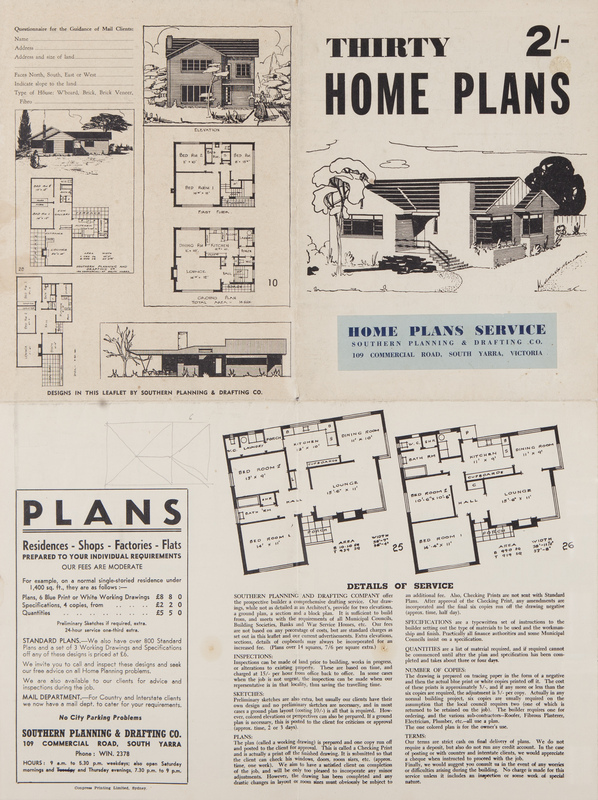 This collection of plans, many aimed at the owner-builder, were assembled from those published as a special feature in the Sydney Truth during 1950. They were described as ‘ideal Australian homes: neither ultra-modern, nor stuffily conservative’. 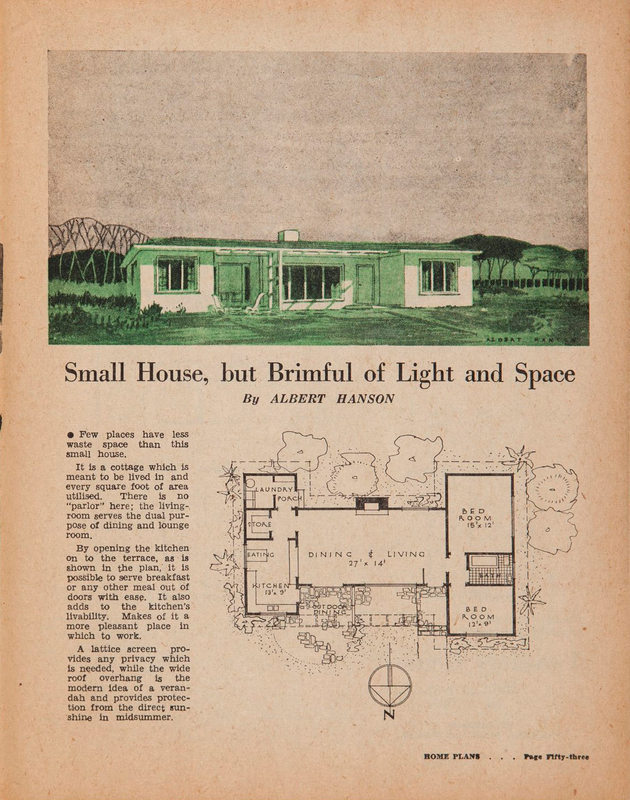 Advertisement for Anthony Hordern’s Modern Home Plans Bureau in Australian House and Garden, January 1954. See library catalogue record for more information. The bureau was located next to Hordern’s recently opened ‘Contemporary Shop’ and was a showpiece for homemakers. Its staff included interior decorators and ‘home advisory experts’. On 1 December 1953 the NSW chapter of the Royal Australian Institute of Architects opened a Small Homes Service, which it had been trying to get off the ground since 1945, in collaboration with Australian Home Beautiful and the Sun-Herald. The service, located on the fifth floor of David Jones’ George Street department store, was geared to providing designs for low-cost houses for the average wage earner. At the same time, the institute intended the plan service to raise the standard and appreciation of good domestic design. Small Homes Service design published in Australian Home Beautiful, December 1953, pp. 20-21. See library catalogue record for more information. Small Homes Service design published in Australian Home Beautiful, December 1953, pp. 22-23. See library catalogue record for more information. Homes for every taste, no 2, Small Homes Service (N.S.W. ), Royal Australian Institute of Architects (NSW chapter), Sydney, c1955. See library catalogue record for more information. Having selected a design, the client of the Small Homes Service paid £10 10s for a full set of plans and specifications, a standard building contract and a guide sheet containing practical advice on how to go about building, particularly as an owner-builder. Designs were displayed at the Small Homes Bureau or published in the Sun-Herald anonymously, but architects received royalties from the sale of their plans. The institute explained to its members that good designs were well worth the time involved. 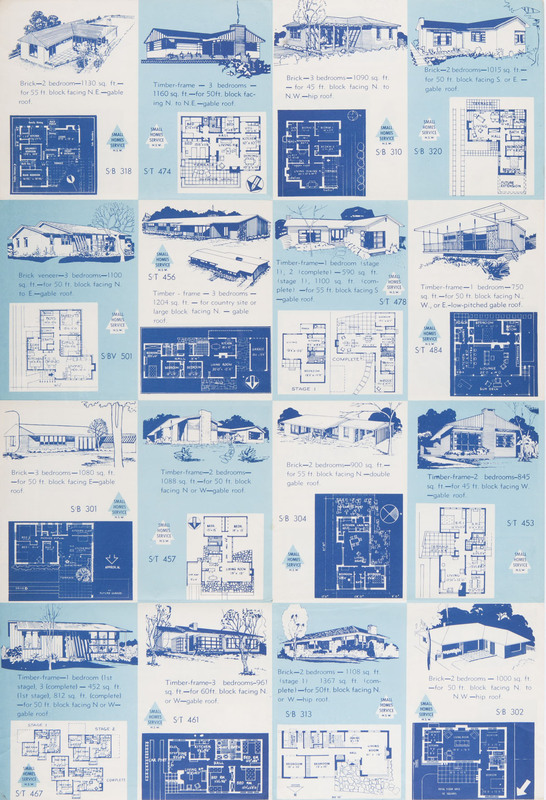 Designs of small homes, Sydney, Wunderlich Limited, 1956. See library catalogue record for more information. The Small Homes Service designs were widely used. 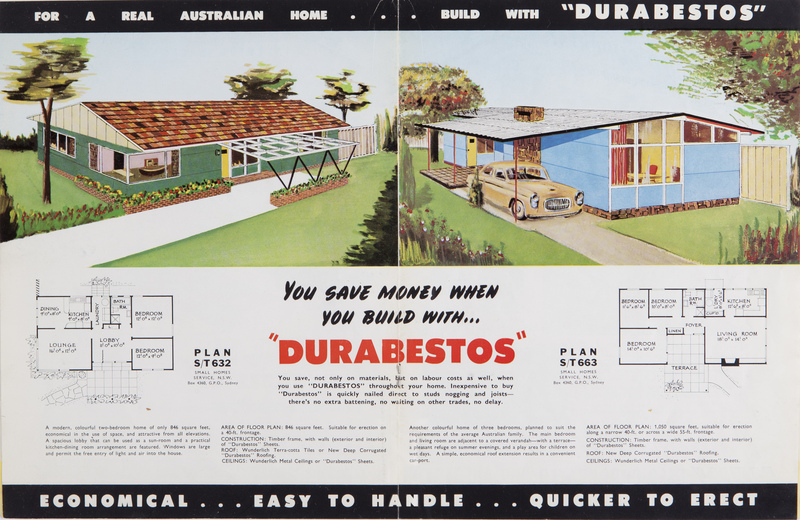 Building materials manufacturer Wunderlich featured them in a brochure advertising its building material ‘Durabestos’. Homes for every taste, no 1, Small Homes Service (N.S.W. ), Royal Australian Institute of Architects (NSW chapter), Sydney, c1955. See library catalogue record for more information. Homes for every taste, no 4, Small Homes Service (N.S.W. ), Royal Australian Institute of Architects (NSW chapter), Sydney, c1955. See library catalogue record for more information. Grace Bros Home Plans Service, established in association with the Sunday Telegraph, Sydney, was launched in April 1954 and operated from the ground floor of Grace Bros furniture store in Broadway. It offered the prospective home builder an architectural advisory service, a range of stock plans, and specially prepared plans drawn to the client’s individual requirements. The store also ran a free decorating advisory bureau beside a full-sized, fully furnished Hudson’s ‘Ready- Cut’ model home. 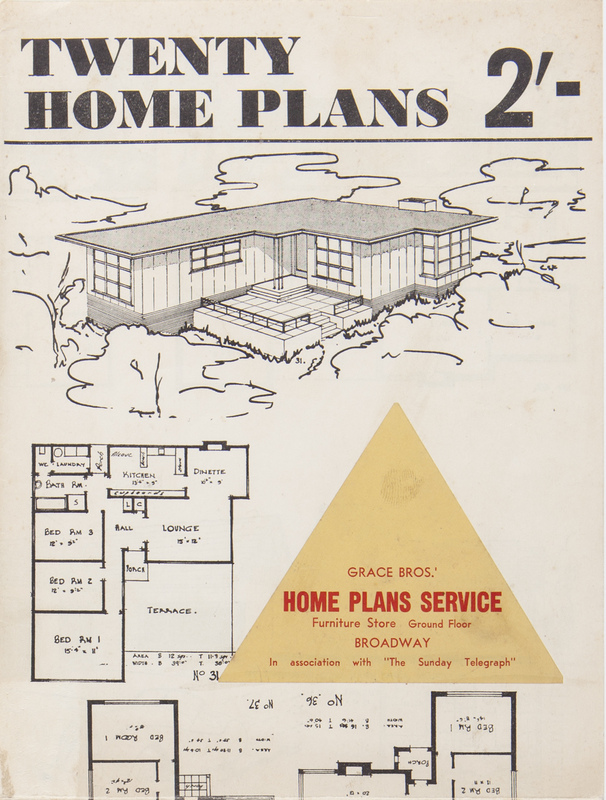 Grace Bros opened a second Home Plans Service in September 1957 in the newly built Parramatta store. A new plan was published each week in the local newspaper, the Cumberland Argus. 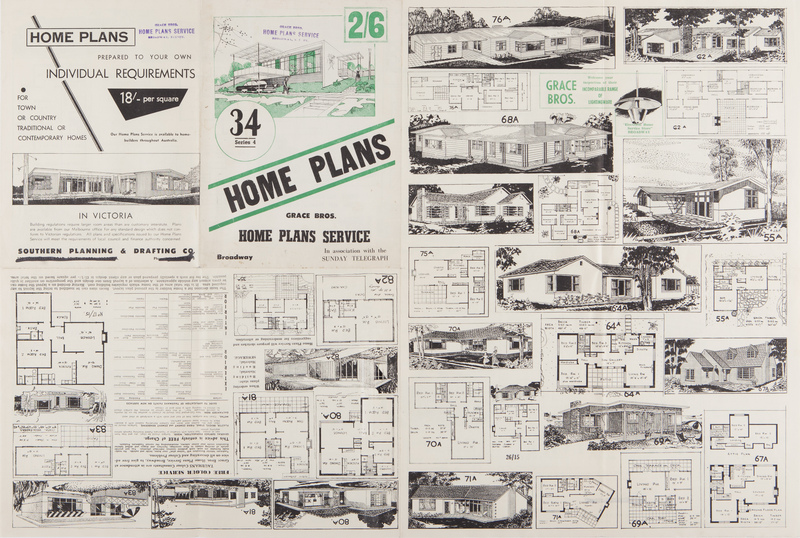 34 home plans (series 4), Grace Bros Home Plans Service in association with the Sunday Telegraph, 1955. Designs prepared by the Southern Planning & Drafting Co, South Yarra, Victoria. See library catalogue record for more information. 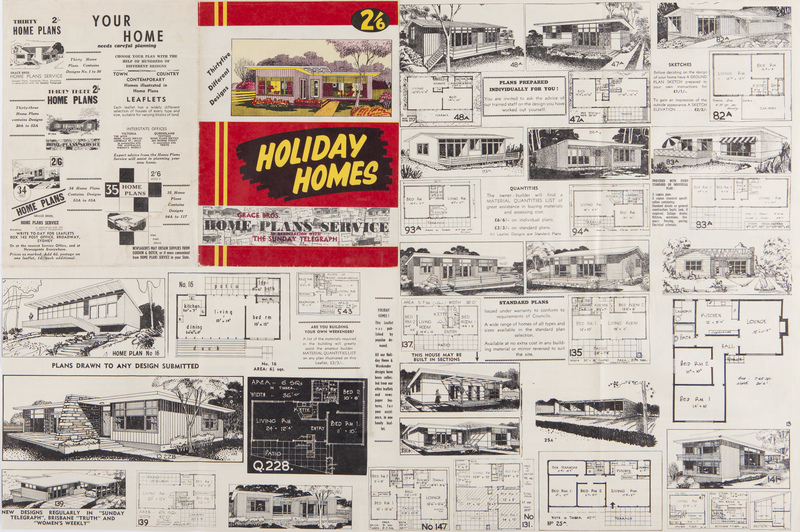 Holiday homes: thirty-five different designs (detail), Grace Bros Home Plans Service in association with the Sunday Telegraph, 1956. See library catalogue record for more information. 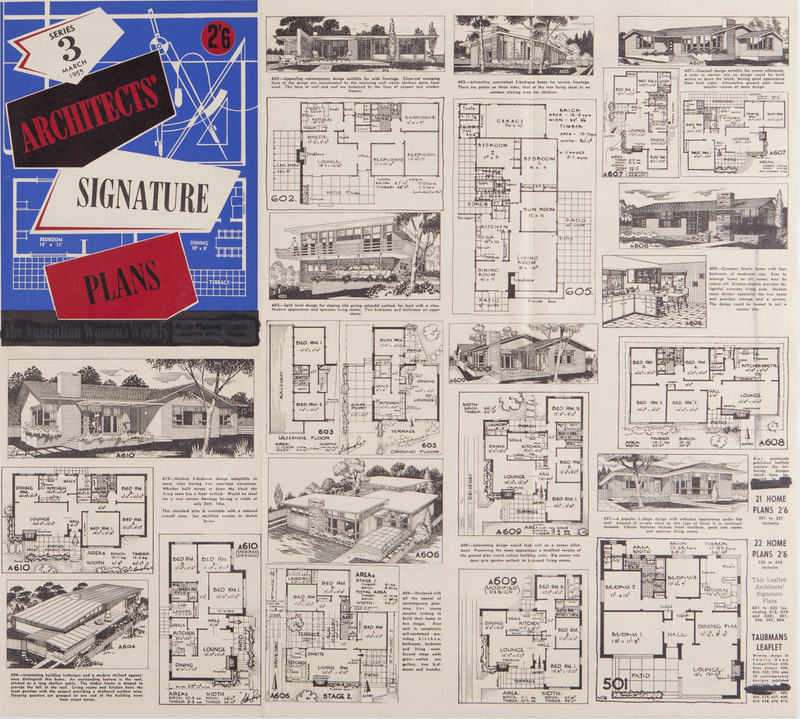 Thirty home plans (detail), Grace Bros Home Plans Service in association with the Sunday Telegraph, 1954. See library catalogue record for more information. Garages, carports (detail), published by the Grace Bros Home Plans Service, 1960. Folded booklet of plans produced for the Grace Bros Home Plans Service in association with the Sunday Telegraph. See library catalogue record for more information. 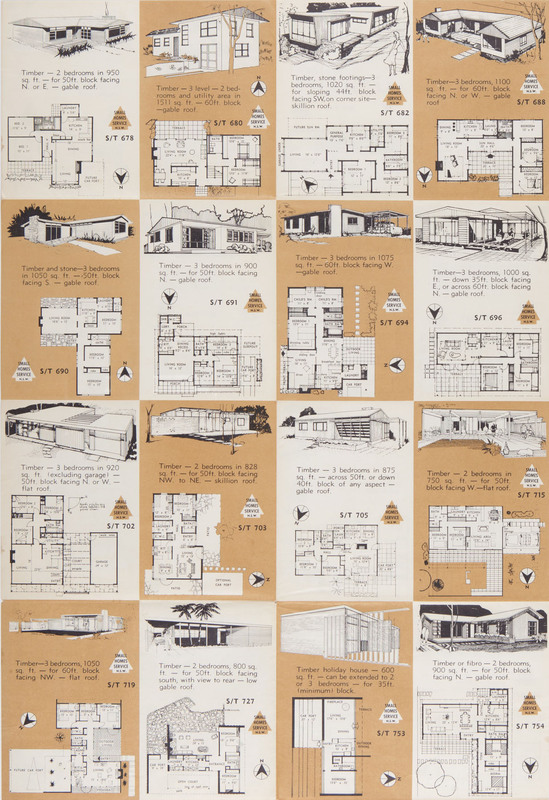 Twenty home plans (detail), published by the Grace Bros Home Plans Service, 1954. 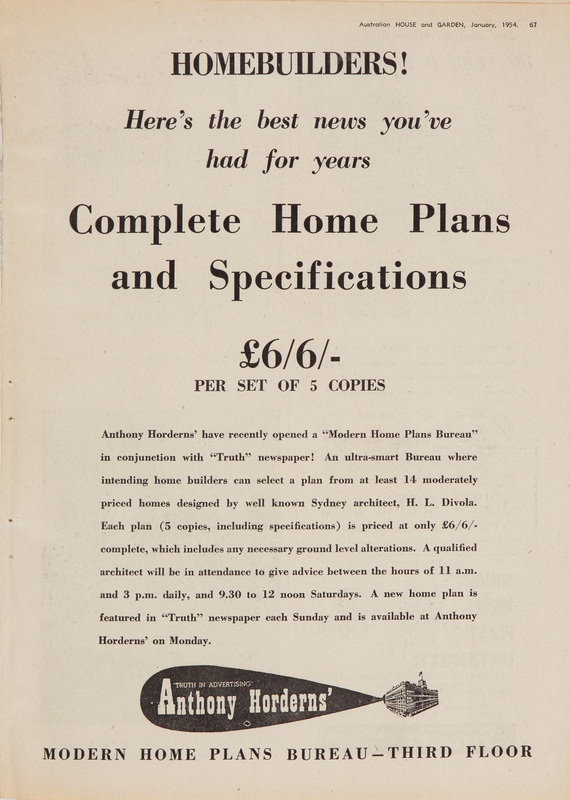 Folded booklet of 20 home plans produced for the Grace Bros Home Plans Service in association with the Sunday Telegraph. See library catalogue record for more information. 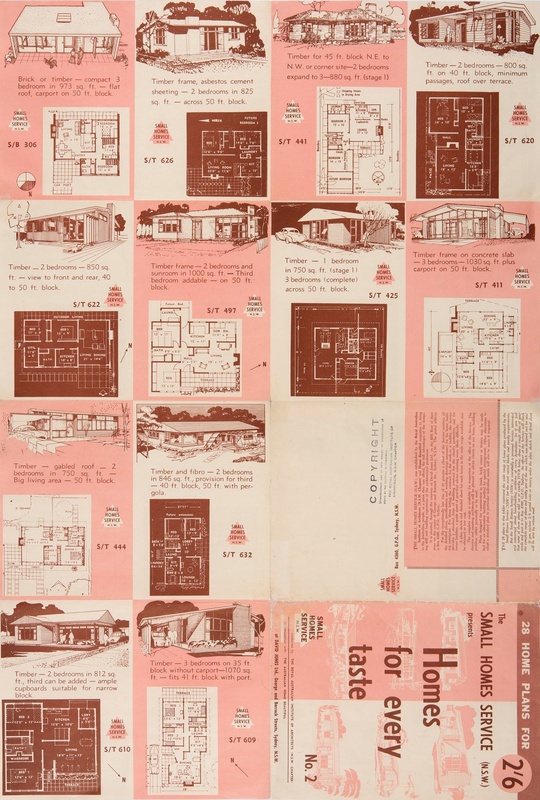 33 home plans, Grace Bros Home Plans Service in association with the Sunday Telegraph [Variant title:Thirty three home plans], Sydney, 1954-55. See library catalogue record for more information. 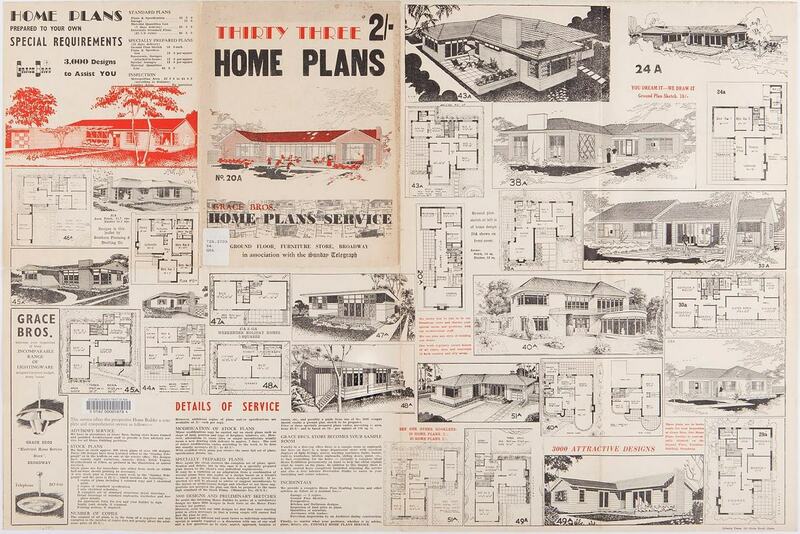 In February 1952 Australian House and Garden published plans for the first of its ‘Build-it-yourself’ homes. This was described as ‘a simple but adequate home, which any man with common sense and the basic knowledge of the use of tools could build himself’. The large number of prospective ownerbuilders struggling with shortages of labour and materials made this a highly sought-after home plan. 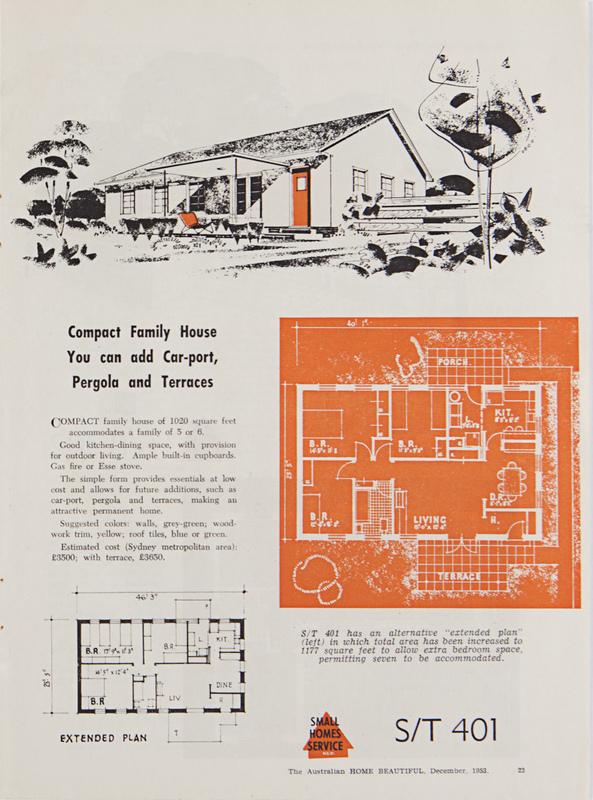 Its success led to the publication and sale by Australian House and Garden of more plans for small homes, and gave rise to a series of booklets. The first, issued in 1955, was titled Book of small homes. 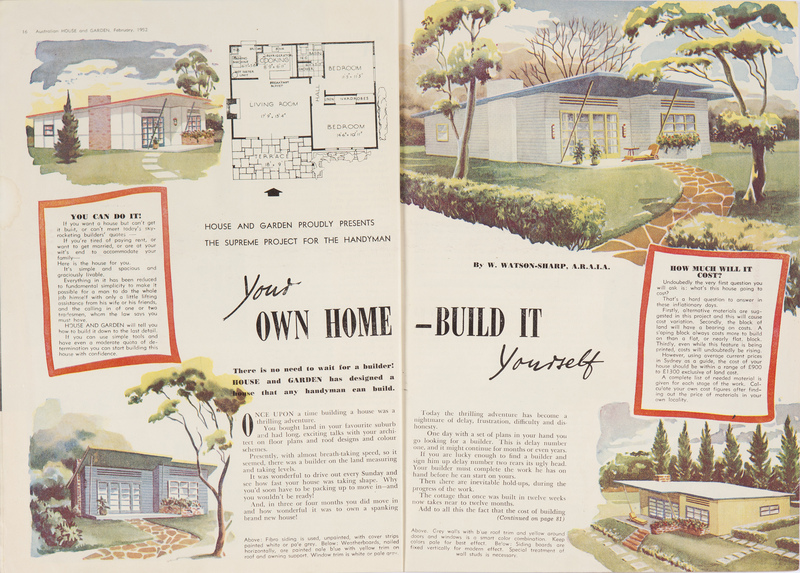 ‘Your own home – build it yourself’, house design by W Watson Sharp, Australian House and Garden, February 1952, pp.16-17. See library catalogue record for more information. 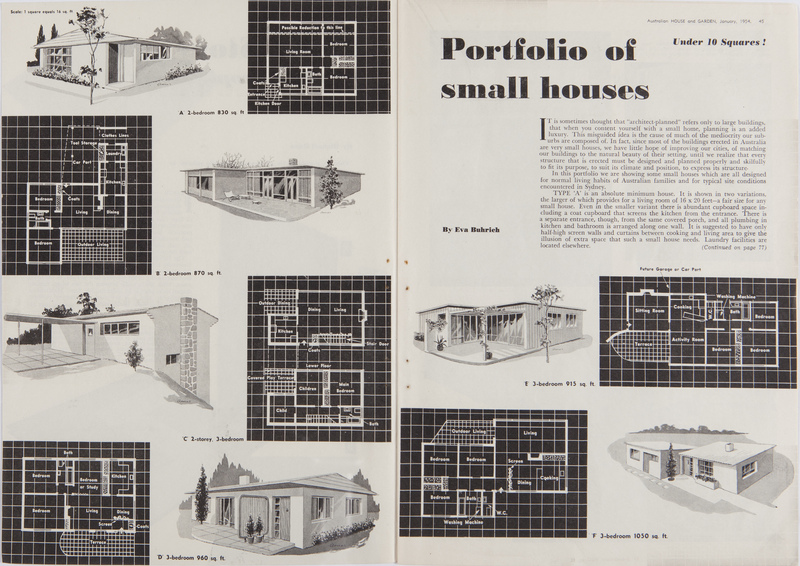 'Portfolio of small houses' by Eva Buhrich from Australian House & Garden, January 1954, pp.44-45. See library catalogue record for more information. 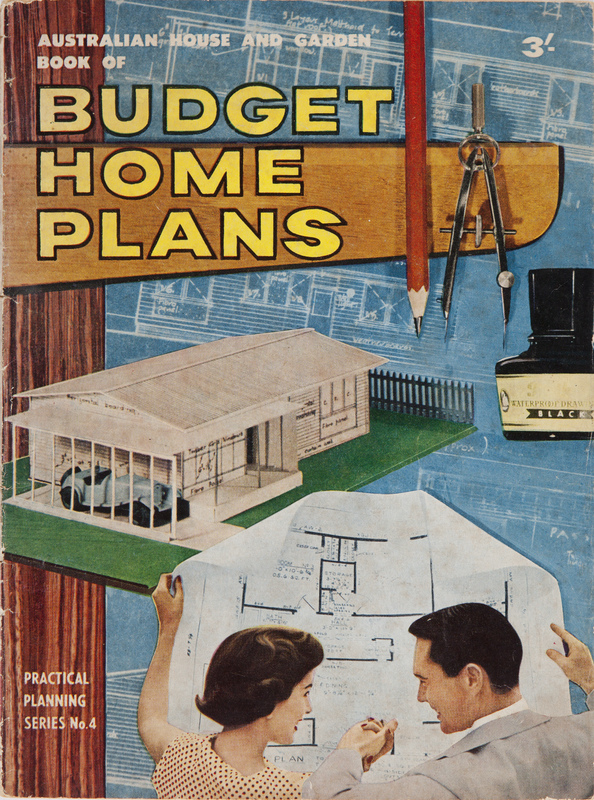 'Australian House and Garden book of Budget Home Plans' (cover), published around September 1957 as no.4 in their 'Practical planning series'. Edited by Beryl Guertner. See library catalogue record for more information. 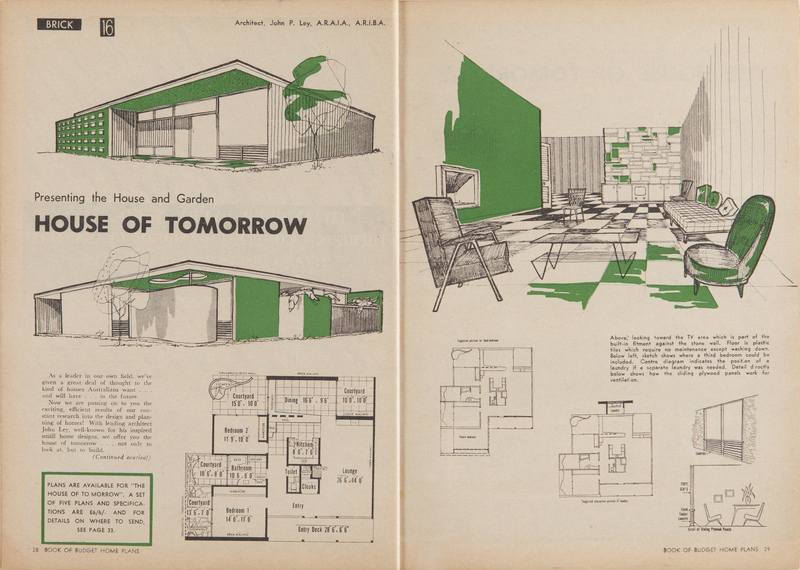 ‘House of tomorrow’, design by John P Ley from Australian House and Garden book of budget home plans, Sydney, 1957. See library catalogue record for more information. 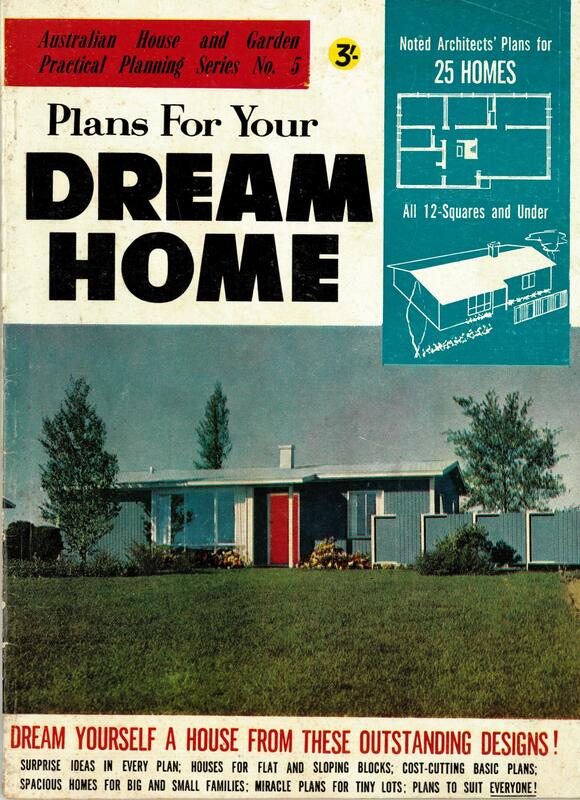 Australian House and Garden plans for your dream home, edited by Beryl Guertner, K.G. Murray, Sydney, 1958. See library catalogue record for more information. Australian House & Garden book of 100 ideal home plans, edited by Beryl Guertner, K.G. Murray, Sydney, 1960. See library catalogue record for more information. 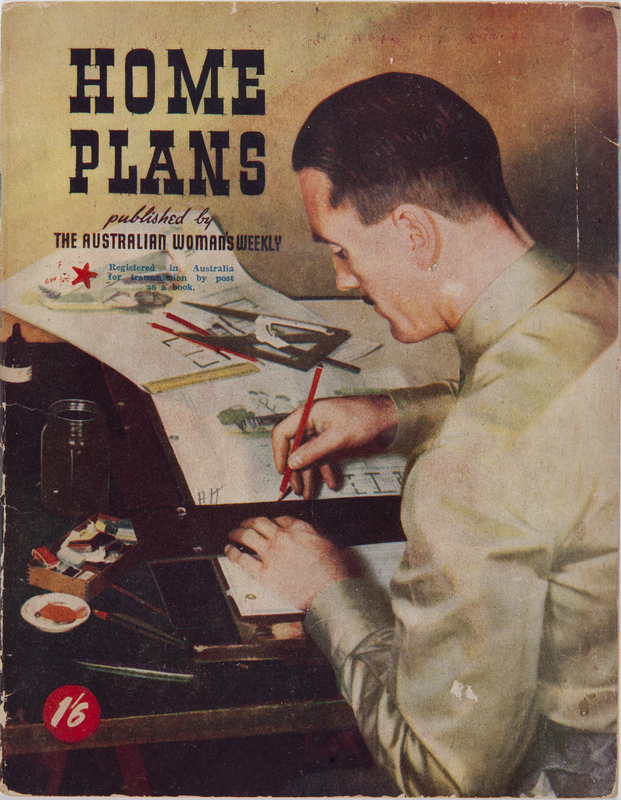 The Australian Women’s Weekly launched its first home-plans service in November 1954, with architect John P Ley adapting a series of US designs for Australian conditions. In late 1956 a new service began in association with Melbourne retailer Myers. Its success led to its expansion into Sydney with a Home Planning Centre established in September 1957 on the third floor of Anthony Hordern & Sons department store. The service published home-plan booklets, and a plan in the Australian Women’s Weekly each week. An advisory bureau offered assistance to intending home owners on such issues as the selection of plans to suit each site, types of materials required and interior decoration. In February 1960 Melbourne architects Borland and Trewenack became the new directors, operating the service until it was discontinued in November 1965. 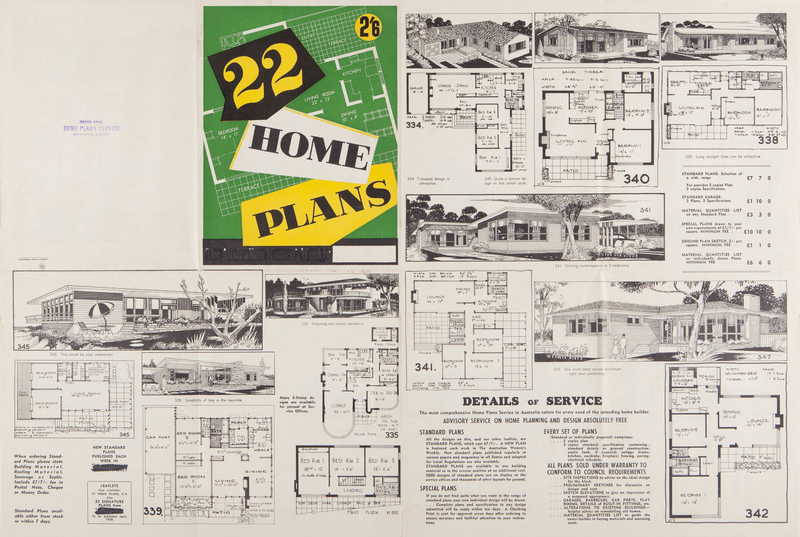 22 home plans, Australian Women’s Weekly in association with Anthony Hordern & Sons Ltd, Sydney, 1958. See library catalogue record for more information. 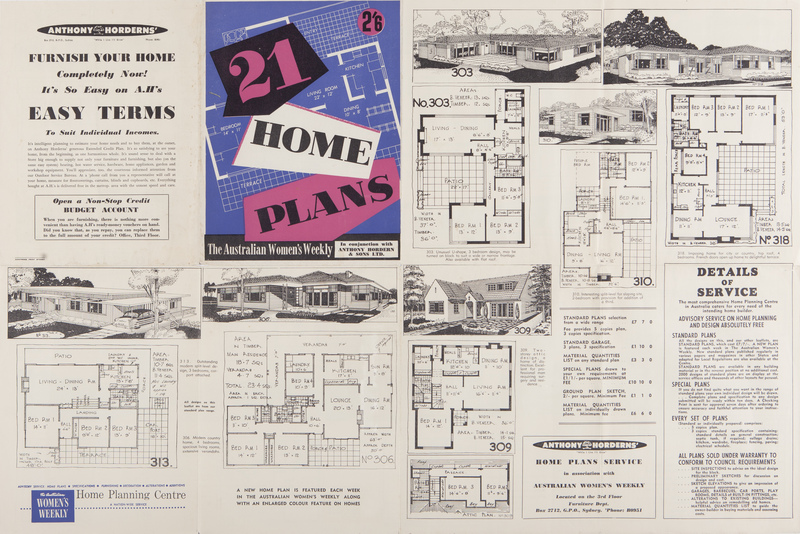 21 home plans, Australian Women’s Weekly in association with Anthony Hordern & Sons Ltd, Sydney, 1957. See library catalogue record for more information. 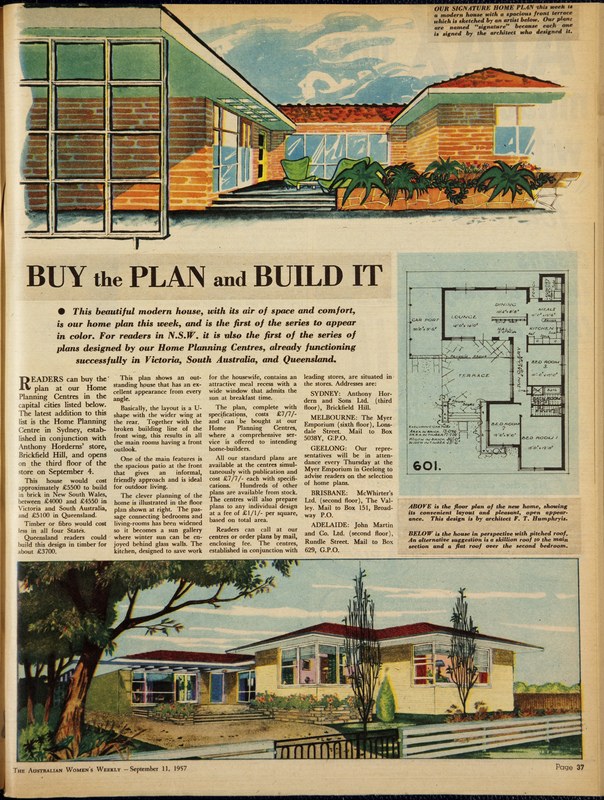 ‘Buy the plan and build it’, Australian Women’s Weekly, 11 September 1957. 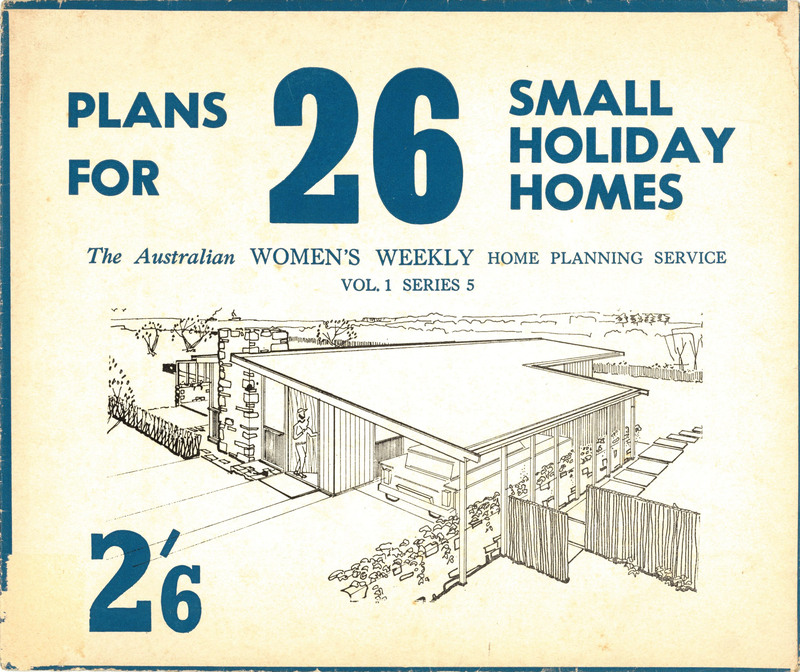 This was the first home plan published in the Australian Women's Weekly's new series. Detail from: Architects' signature plans: Series 3: March 1959, Australian Women's Weekly, Sydney, 1959. See library catalogue record for more information. Plans for 26 small holiday homes: Vol. 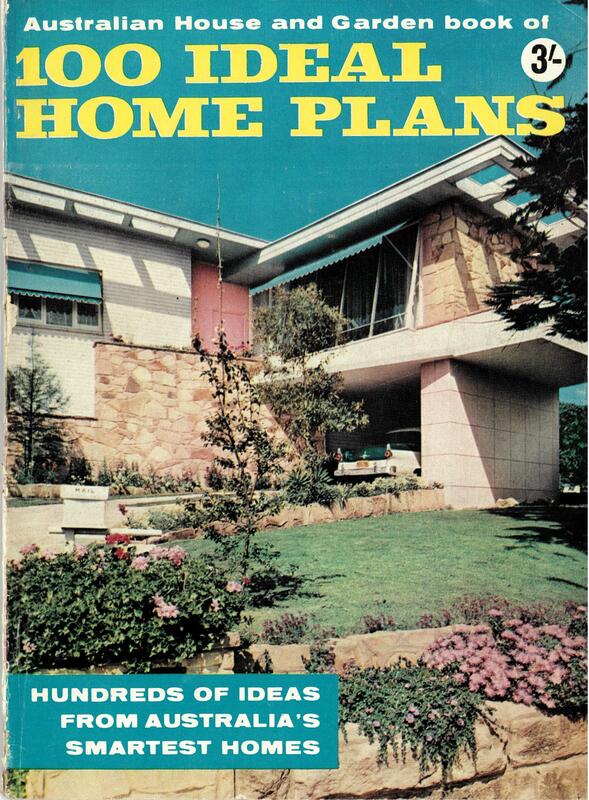 1 series 5, The Australian Women's Weekly Home Planning Services, Sydney, c1961. See library catalogue record for more information.